As a schoolboy in Bermuda I enjoyed an unplanned day of reading and daydreaming when the weather kept me from fishing or walking with a friend on the beach. 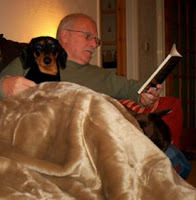 Come the rain, wind and cold, I reached for a book, a blanket if necessary, a spaniel, and settled on my mother's sofa. I recall the day I presented myself at the Senior Library, almost certainly the first moment I was able to do so. Would I have been twelve or thirteen, perhaps? That is when I started reading histories and biographies. I am blessed in having had friends who pass books along to me, and who generally know exactly what I'd appreciate. Nearly every book I read has been handed around a group and I still use the public libraries. These days and nights, I am drawn to non-fiction first, and the classics. I am reading plays. And I have looked for novels set in the part of England where I live, and/or written by local authors. I still enjoy a good biography. In the past few months I have read several histories on the First World War. And I have been reading Alan Bennett's autobiographies, Untold Stories and Writing Home. The book I'm holding in the photograph is the stage play, The History Boys, which is brilliant. Bennett adapted it for the film, and that's terrific too. I've watched it many times as it's a great way to spend ninety minutes enjoying fine language and thoughts. I was something of a history boy myself. I celebrated another birthday recently, and, using some money my sister sent me, I bought something which is, I suppose, a bit naff. A faux-fur mink blanket. It's 79" square, and warm as can be. It feels lovely. Cailean is not sure whether it is friend or foe, and growls at it from time to time, then burrows under it (the underside has a faux-suede finish) for several hours. Friend. That's the blanket in the picture. I look pretty damn good for 82, don't I? That's because I'm not nearly 82, which would be my mother's age. It has been a chilly, rainy day. Not fit outside for man or beast, as WC Fields put it, and perfect for lounging about under the faux-mink. We posed for the photograph, time delay, but had been reading through the morning, and continued to do so all afternoon. Cailean popped up for the flash. He did not bark: I was worried about him disturbing the neighbours when I got him, so I trained him to bark in Braille. If he needs to alert me to something at the door, he stands by it and paws the floor almost silently. I read a bit, then wondered about this really odd and vivid dream I'd had last night about a time machine set to go from my mother's back garden except for the fuel. All it needed was gossamer from fairies' wings. Now, instead of gossamer in Bermuda, it's back to The History Boys and the touch of faux-mink just north of Narnia. Ross Eldridge lives in a tiny North Sea town on the coast of England near the Scottish border. He reads a good deal, has a go at photography, and researches family history. Ross has written a weekly newspaper column, but is now content to blog. His blog is called Barking Mad in Amble by the Sea, and it is dedicated primarily to his little dog, Cailean.